The topsail schooner LA JACINTHE was one of a class of eleven schooners built for the French Navy to the draughts of the shipwright, J. F. Delamoriniere. Built in 1823, she was designed for service in the colonies and for protecting merchant shipping. By the French Service Historique de la Défense a detailed plan was published of the schooner LA MUTINE (the same type as LA JONCILLE and LA JACINTHE), that was printed as part of the Atlas du Génie Maritime. The plan is available for download. The plan shows the schooner carrying two 12-pounder carronades, gives hull lines and lateral view, deck plans and sail plan. It was drawn in 1825. 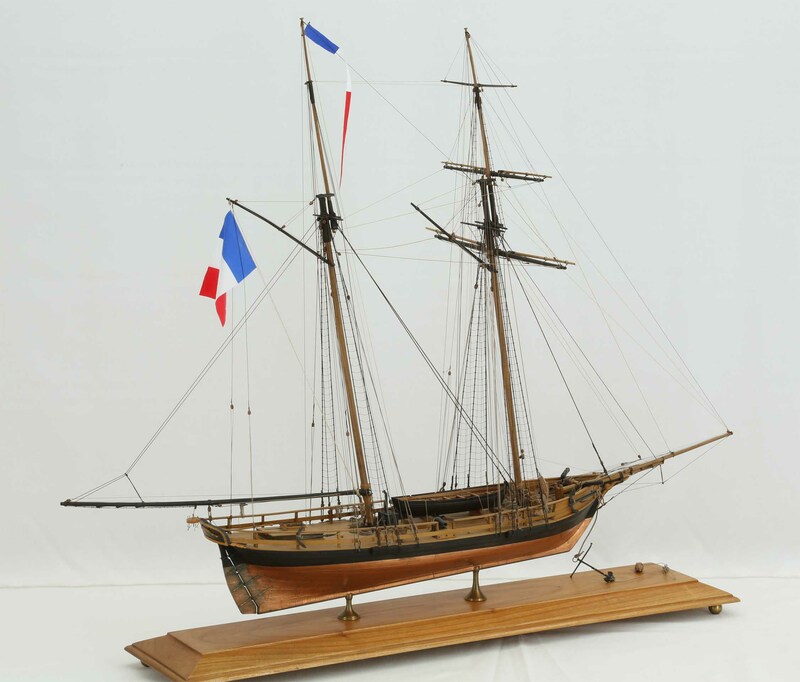 The ship model was built to plans by Jean Boudriot, Monographie LA JACINTHE, Goélette 1823, ANCRE 1990. This model of the schooner LA JACINTHE is a very beautiful, fine piece of work, a true masterpiece. The ship model is 1 : 48 scale. Length is 78 cm, width 30 cm, height 65 cm. This model is not available for sale. The pictures and the data are shown in the gallery of the ship models sold only to let enthusiasts and model makers enjoy the photos and maybe get ideas or some guidance, if someone builds such a model by himself.